July 31, 2009 at 6:06 pm | Posted in General | Enter your password to view comments. Nemetschek Romania launched a software package dedicated to “Calculating the energy efficiency of buildings”. The software, which is fully translated into Romanian and complying with the current legislation, uses all the architectural data from the unique model of the building, avoiding the potential errors due to defining the building through a great number of numerical data, that are difficult to manage. The package supplies all the features necessary to obtaining an energy efficiency certificate, including instructive tutorials. Obtaining an architectural model is very simple. After 10 to 12 hours of preparation, a user with no experience in assisted planning can, in approximately 3 hours, make a model of a P+4 apartment building, with two entrances, in compliance with the requirements of the Energy Efficiency of the Buildings Program. The software automatically determines the physical characteristics of the architectural elements, allowing the Certificate for Energy Efficiency of the Building to be printed with just one mouse click. The certificate is obtained according to MC001/2007 and elaborated by applying the law 327/2005, which includes energy consumption for heating, hot water and lighting. Also, the software offers a quantity list of added materials (e.g. new insulation layer) for rehabilitation options. Nemetschek offers live demonstrations to those interested in test running the software program. Ecological buildings are slightly more expensive, but more valuable as well, when compared to standard constructions. 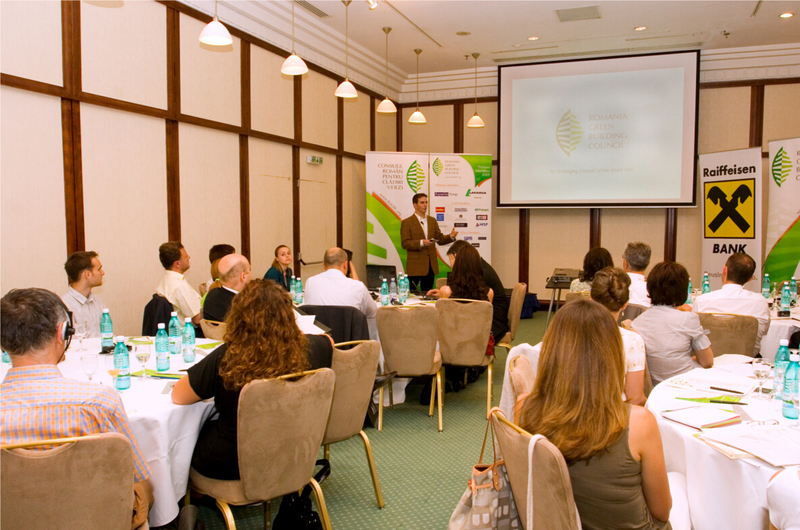 This was the main conclusion of the informative workshop organized in Bucharest, by the Romania Green Building Council, July 7th. On the long run, both the tangible, and the intangible benefits of a sustainable building make it far more profitable than a regular building. For developers, investing in a green building instead of a traditional one means reducing risks, since such an investment attracts buyers interested in the reduced operational costs, better working and living environments, and other benefits of a green building. „Building green requires more upfront investment only if compared to building sub-standard quality constructions. You can try to save money by constructing poor quality buildings but strengthening building codes and enforcement, falling costs of technology , the missed benefits of better planning and design principles, and growing awareness among buyers of energy cost considerations will make it a poor investment strategy.“ explained Steven Borncamp, President of the Romania Green Building Council. When talking about the tangible benefits of green buildings we are referring to energy savings of 30 % to 50%. To these we add benefits that are more difficult to measure, but are very important to companies, like a better reputation, better CSR programs, a decrease in employee absenteeism and an increase of employee productivity. A study published by Greg Kats for the Massachusetts Technology Collaborative shows that employee productivity is 1% higher in companies operating in LEED – one of the international green building certification schemes – buildings. The certification costing only .6 percent more of total costs for the basic green building certification compared to standard buildings. The same study indicates that an initial increase of 2% in the upfront costs for green design will yield life cycle savings of more than ten times the initial investment, or 20% of total construction cost. Another element which raises the value quota of green buildings is the fact that green buildings are slower to depreciate than normal buildings. Since they use much higher building standards than normal buildings, green buildings have more chances to maintain a good position on the market, even when basic standards are heightened. Today, when thinking of a green building, we also think of premium prices. Yet tomorrow it is possible to notice a change. The specialists are expecting that, in the near future, buyers will no longer agree paying more for green buildings, but will probably ask for a price deduction for traditional buildings. Moreover, significant market shifts are expected to happen in the green building sector with mandatory Energy Performance Certificates enforce in Romania from 2007 by the EU’s Energy Performance in Building Directive (EPBD). A stronger version was approved by the European Parliament, earlier this April. Following a likely adoption by the Council of Ministers, each Member state must transpose the stronger standards into national legislation and draft new laws, action plans, and strategies to accomplish the set targets. The goal is having all Member states ensure that all new buildings are at least “net zero energy” buildings by 31 st of December 2016 with public buildings subject to these standards three years earlier. Romania Green Building Council organized a half day workshop to equip real estate developers and investors, valuation experts, financiers, facility managers, architects, engineers, project managers and other stakeholders with a better understanding of the ways in which sustainability affects the level or risk, and subsequently the value, associated with a green building. Trainers for this event were: Steven Borncamp – RoGBC, President and CEO, Florin Dobrescu – Technical Advisor and Member of the Board of the RoGBC and General Manager of STARDOME, and Laura Nemoianu – Marketing & Operations Manager for the RoGBC. The trainers highlighted the key business case value factors for the various stakeholder groups and explained how sustainable buildings provide benefits in each instance. With a room full of people, the July edition of the Green Cafe marked a successful start of a discussion session the RoGBC plans to hold this summer. Following this month’s edition addressing the future of green buildings, the August edition will focus on urbanization and adaptive reuse of buildings. For those of you interested, but unable to join us in this month’s Green Cafe, here is a short summary of what happened at the meeting. To ignite the debate over the possibility of greening the future Romania, we watched two inspiring short documentaries. The first one, “Deeper Shades of Green” demonstrated the need for integrating eco-principles into the building habits, by showcasing successful high-class examples of intelligent buildings. Identifying the path from the current Romanian market state and the ideals promoted by the documentary was the catalyst of the discussion. A dominating idea during the debate was that one of the present challenges for Romanians is to succeed in fitting high intellectual needs – like having a green home – in the nation’s priorities, while succeeding in satisfying the basic needs too. The second documentary provided excellent insight on this particular subject by supplying the example of the old Harlem. The short movie, called “Build”, also presented modular homes as an energy efficient alternative to traditional homes and highlighted the possibility of growing one’s home as a futuristic option. 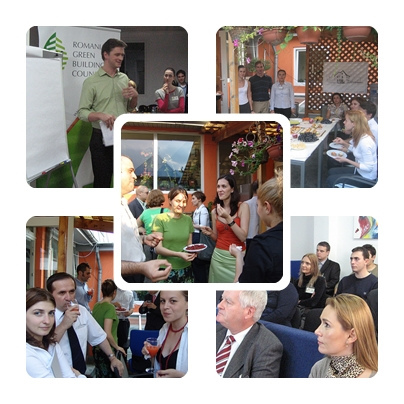 The Romania Green Building Council is pleased to organize and host a “RoGBC Green Cafe”: a meetup dedicated to creating an informal, yet constructive dialogue between various green building stakeholders in the construction sector: architects, technical consultants, engineers, developers, educators, students, etc. 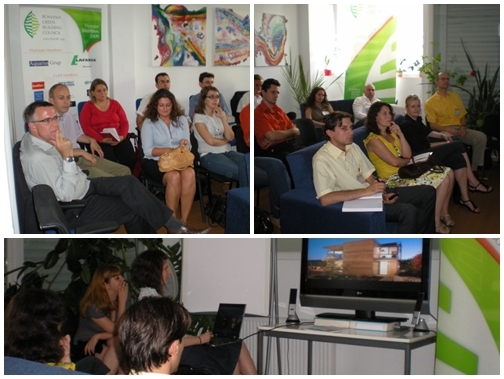 The theme for the 16th of July will be the “Future of Green Buildings”. A short film will be viewed followed by a moderated discussion among the participants. Popcorn, light food and drinks will be served. Who: Participants from all construction disciplines are invited. Seats are limited to 25 persons. When: July 16th, 2009 – 4pm. Where: The RoGBC office (click here for directions). Cost: This event is free (If you register but do not attend or cancel your registration prior to the event, a 100RON payment will be invoiced). To register, please send the attached form to alina.kartman@rogbc.org. The list with participants will be published on the RoGBC blog once the seats are filled. If the event will be sold out before you register, your name will be added on a waiting list. Some pictures from Steve Borncamp’s presentation in May at the Czech National Technical University regarding the activities of the Romania Green Building Council and green building activity in the region.